Welcome to this episode of the Real Fast Results podcast! MJ DeMarco is today’s special guest. He is an author and successful business owner. MJ wrote a book called The Millionaire Fastlane. In it, he describes how he built a company, basically, from the ground up, and then he was able to sell this company for millions of dollars. DeMarco is also the founder and administrator at TheFastlaneForum.com, which is a worldwide discussion forum that’s dedicated to the advancement of fast lane entrepreneurship. This forum has over 130,000 visitors a month, and it is one of the leading destinations for startup entrepreneurs and offers discussions on how to grow a business. What M.J. is really doing, overall, is calling out to folks that are tired of taking a “slow and steady” pace and the conventional ways of growing wealth and a business. Welcome to the show M.J.
A “product-o-cracy” is based upon a unique product offering/service that is not offered by someone else. Click To Tweet A good example of a way to look at this is that there’s always a restaurant in your neighborhood, or in your city, that’s always crowded, but they don’t advertise. That’s the essence of a product-o-cracy. It’s when you have a product that is compelled by word-of-mouth and there’s an expansion, so the need to advertise becomes secondary. A lot of entrepreneurs are not running product-o-cracies; they are running marketing firms. So if they stop advertising, their business slowly starts to die. That’s the difference between just a regular old business and a company that’s running a product-o-cracy. 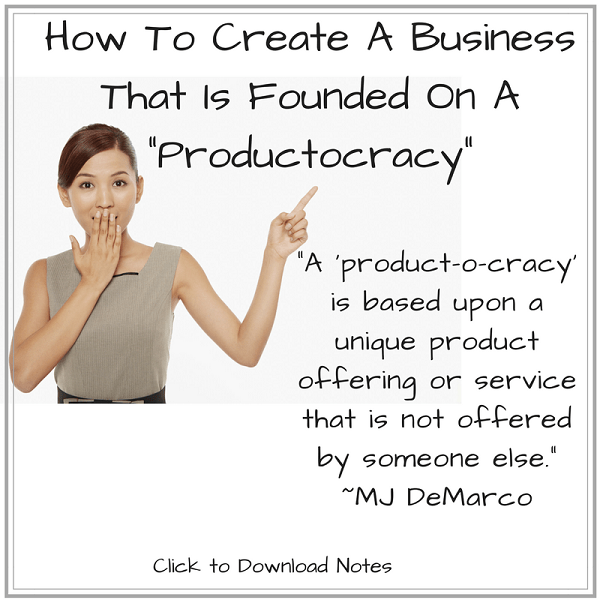 A great example of a product-o-cracy is my book The Millionaire Fastlane. I think that I must have spent $3,000 in total on promoting it since it was released seven or eight years ago. The growth was not because I’m some kind of great marketer or because I hacked something. The growth was because the product was good enough for people to recommend over and over, and that, in essence, is the product-o-cracy. You can connect with me through TheFastlaneForum.com. It’s a forum with hundreds of thousands of entrepreneurs. Feel free to join. It’s free!